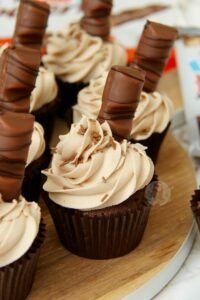 Light, Hazelnutty & Chocolatey Cupcakes, with Kinder Chocolate Buttercream Frosting, and Kinder Bueno make the most delicious Kinder Bueno Cupcakes ever! Last year I posted my recipe for my Nutella Cupcakes and they’ve always been a great success with my friends and family. I’ve been asked a few times to post something Nutella-y, but something a little different. 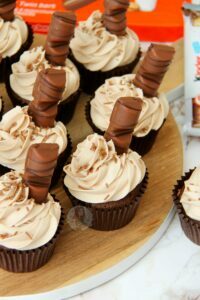 I’ve always adored Kinder Bueno as its just so good. 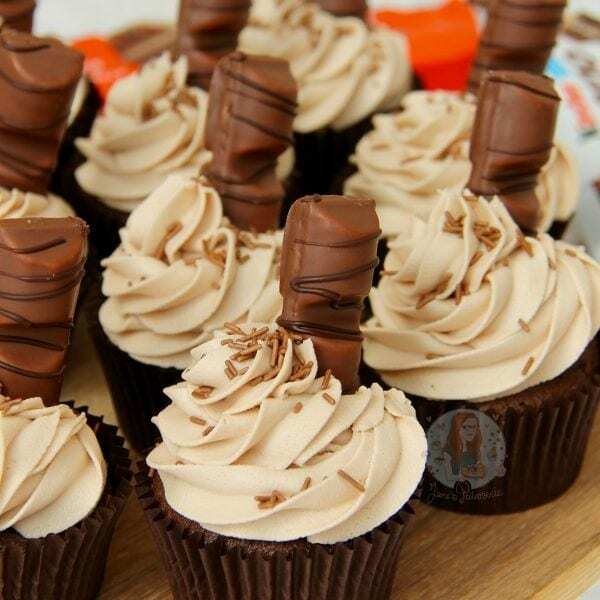 When I make my Nutella Fudge, I often use Kinder Bueno on top, and its perfect. Using a light and chocolatey cupcake sponge, with some Sweet Hazelnut & Chocolate flavouring, topped with some Kinder Chocolate Buttercream Frosting. Obviously, then came the Kinder. When Foodie Flavours sent me some of their new flavours I knew I would like them as the others I have tried in the past are just amazing and I am not saying that for more freebies. Honestly, if I didn’t like something, I would be honest about it! As this flavouring really was so damn delicious.. I seriously recommend it. It wasn’t full on nutty and a bit eurgh which can sometimes be too much for some people, it was just the right amount. 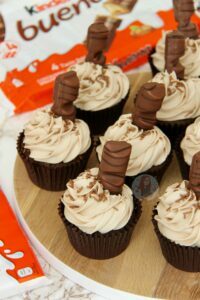 It gave the cupcakes an extra kick of chocolateyness with the hint of the sweet nutty flavour in the background. Obviously, you can just use vanilla extract in its place if you wish, but I’m glad I used this! I decided to use a similar cupcake sponge to my Honeycomb Crunchie Cupcakes, as I just adore the recipe. They’re so light, with a slight hint of a caramel flavour from the Light Brown Sugar. With the Foodie Flavours Sweet Hazelnut Chocolate Flavouring, its just heavenly. As much as I have posted this basic cupcake recipe a few times now, the buttercream is new. I used Kinder Bueno on the top of the cupcakes as I adore them, but you can use more of the Kinder Chocolate, or even some Ferrero Rocher… or even anything else you fancy! 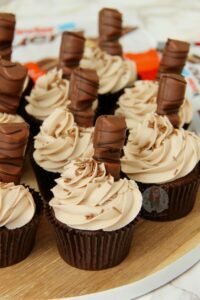 Honestly, if you are a chocolatey, hazelnutty fan then these are ideal for you! Enjoy! Cream together the Butter and Light Brown Sugar with an electric beater till smooth – add in the Eggs, Flour, Cocoa Powder, Sweet Hazelnut & Chocolate Flavouring, and beat again till combined on a Medium Speed. Once combined it might still be a little stiff, so loosen with the Whole Milk – using Whole Milk is important as lower fat milks might make the mixture split slightly! Spoon into your Cases and Bake in the oven for 18-20 minutes or until cooked through! Leave to cool on a wire rack. Once the cakes are cool, make the frosting – Melt the Kinder Chocolate Bars in the microwave on a low/medium heat until smooth – leave to cool. Beat the room temperature butter until smooth. Add in the Icing Sugar 1/3 at a time, making sure the sugar is fully incorporated until moving on! I use my KitchenAid for Frostings as the machine can make it so much lighter and fluffier! Once all of the Sugar is in the Frosting mix, keep on beating the Frosting but add the melted and slightly cooled Kinder Chocolate – beat again. If its looking a bit stiff, or a bit odd, add a tsp or two of boiling water and continue to beat until smooth. 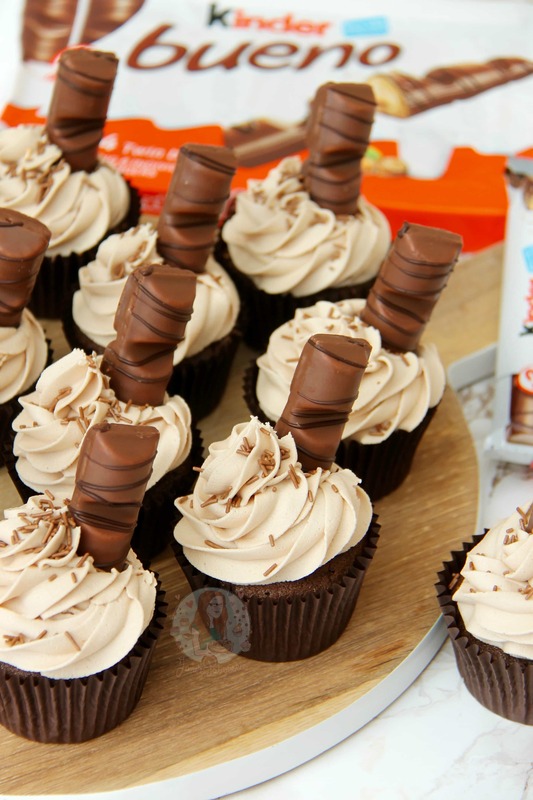 Decorate your cupcakes how you like, I stick in half a bit of kinder bueno each, and sprinkle on some chocolate sprinkles – and ENJOY! You can buy the Sweet Hazelnut Chocolate Flavouring here! But if you don’t want to use it, you can use 1/2 tsp of Vanilla Bean Extract instead! You can easily use Ferrero Rocher on top of the cupcakes instead if you like, or anything else! If you don’t want to use Nutella, you can pretty much use any flavour spreadable you like! Or you can use 100g Melted Chocolate instead! You can bake these delicious cupcakes into a layer cake by doubling the cupcake ingredients and splitting between two deeper 8″ tins, and baking till springy to touch and baked through (see my other cakes for details on time!) – then double the filling as well, and slather all over! These delicious beings will last in a container for 3 days! Find my other Cupcakes Recipes on my Recipes Page! Older Next post: No-Bake Bounty Cheesecake! Newer Previous post: Mint Chocolate Chip Cookies! What can i use instead for Sweet Hazelnut Chocolate Flavouring? Hiya – Maskine? You need to follow the recipe as stated to make the frosting. It’s a buttercream, so you need the butter. The chocolate and sugar on its own won’t work. I ordered the flavouring but have been sent hazelnut instead. Would this be an alternative or would I need to add anything else to it? Thanks. Can i substitute the “Sweet Hazelnut Chocolate Flavouring”? Yep, check the tips and ideas section where ive mentioned this. That buttercream looks perfect! ? I’ve seem to always fail with buttercream 🙁 any helpful tips?? ? 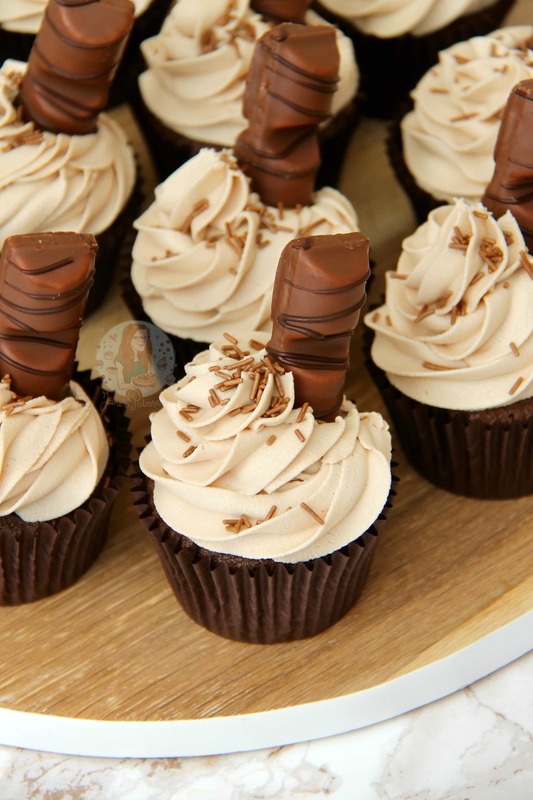 Hi Jane – what nozzle do you use for decorating the cupcakes please? a 2d closed star usually, or a 1m ? Hi, can I use caster sugar instead of light brown sugar? Thank you! Also am I able to use semi skimmed milk instead of whole milk? No – that can cause the mixture to split. You really need to use whole milk. What tip are you using? Kinder Chocolate Bars are the just chocolate.. Kinder Bueno Bars are the waffle ones. As I have written Kinder Chocolate Bars I used the chocolate ones. You wouldn’t be able to melt the waffle down. I’m an American and my husband and I host exchange students. This year we have a German student and she has introduced me to the wold of Kinder and I love them! I would love to try my hand at these cupcakes, but I’m having a terrible time finding the extract, it almost looks like it isn’t available in America. Would you possibly know, or any fellow readers know, if it might be available in the United States and where to get it? Thank you! It probably isn’t available in America – you can just substitute it for Vanilla it will only be a slight difference in taste and still yummy! But I don’t like too sweet buttercream, did you have a tip for me ? Add a pinch of salt to the buttercream? Hello! What can I use instead of Self-raising flour? 🙂 thanks! I would use the same weight but Plain Flour, but also use 1+1/2 tsps of baking powder! Hiya! I’m sorry but I don’t post in cup measurements or ounces as I am truly a ‘Grams’ girl.. You can find some tips on my Helpful Tips page, or simply google each ingredient and amount converted into what you want. These look amazing – they’re so beautifully decorated and easy to identify the flavour of the cupcakes which is really nice – would love to try these out!! ? These look so so delicious! That frosting is so light and fluffy and it has kinder chocolate melted into it?! Oh wow. I’m sold. I need to whip up a batch of these! Hehe thank you Kathryn ☺️? I hope you love them if you do! !